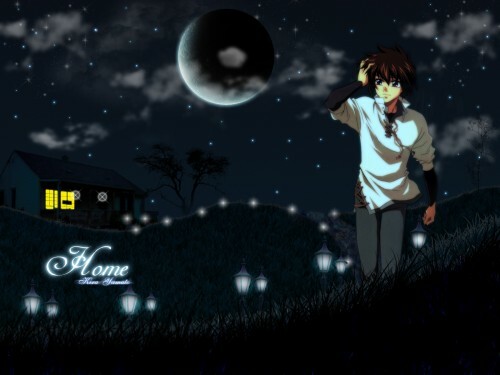 Ok first off it took me alot of consideration to find a good picture for it as well as the house. I tried to make it as if it was actually Kiras home with the lights and everything. I also made A sort of Grassy terrain with path lanters. The Sky was a real challenge trying to get it as nice as possible, the actual real challenge was to find the pictures to go into this WP. This is way over 100 layers and compressed it from 987kb which was huge :P got it down to about 700kb. I Love this wp and its immediately going onto my desktop ^_^. ooo, lookie, its Gundam Seed (I think I should really watch the anime, I ever seen it <.<). The effects that you used look really great! The grass and the light posts are a really nice touch! The tree, looks a little too pixally, <.< and the stars have a little too much bright action. They don't really look real, but the scan is a great! You did a great job on the extraction! Loving the mist effect on the right, you should have done that more!! Moon looks great and the house really fits in, great job on this!!! Favie!!! veeeryyy nice background!!! is really cool! and it looks peaceful n_n just like the right place for Kira lol :D awesome! love it! I really like this wallpaper. I love the scan of Kira. The mood of the background is suitable with Kira. lizzie wubs the sky.. though some of the stars look a lil too bright. the blue ones. umm... the hill where the house ish... that grass on that part looks a lil weird. since you've used brush for the front grass.. i think you should continue to do so for the rest. and the lamps looks a lil too short. Wow, this is a really good wallpaper. I like the background with the stars and the moon. It looks very cool. It's a really nice wallpaper you did~ Kira blends nicely in it and I pretty much like everything except for the yellow light, if it could be a little less yellow and strong it would be perfect in my opinion. :D Still I think it's really nice and I get the feeling of it all. The path seems kinda wierd, the lamp posts in the distance... aren't there. I mean, cool with only the light but they aren't even suspended in the air like the ones up front! The character doesn't seem to walk on the path, either... maybe he isn't supposed to? If you look away from these small facts, you ahve a wonderful wallpaper with lots of feeling and work put into it... realy good. Great colours, composition, lightning, sky, grass... it's realy nice and warm. Love that show too.